Enjoy the unique atmosphere of a bright and spacious, welcoming home with two double en-suite bedrooms and twin room; two large reception rooms & studio. Lustica House retains an original olive mill as part of a dramatic stone kitchen and 2 large terraces. Visitors to the Lustica will be impressed by sparkling clean sea and beaches, and impressive views at the sea entrance to Boka-Kotorski fjord (fort-island of Mamulla). Enjoy the tranquil countryside and traditional way of life of the old stone villages– once dominated by olive and small scale agriculture and old Roman salt mines, turned bird sanctuary today. Laid out on three levels, the tastefully Nepalese decorated summer home has a bright (south-west facing) aspect and spacious interiors. Guests can enjoy the best of both worlds with beaches and peaceful countryside at your doorstep, while busier and historic centres of Budva, Kotor and the new marina (Porto Montenegro) are a short drive (Kotor, Tivat 35 min. Budva 45 min). 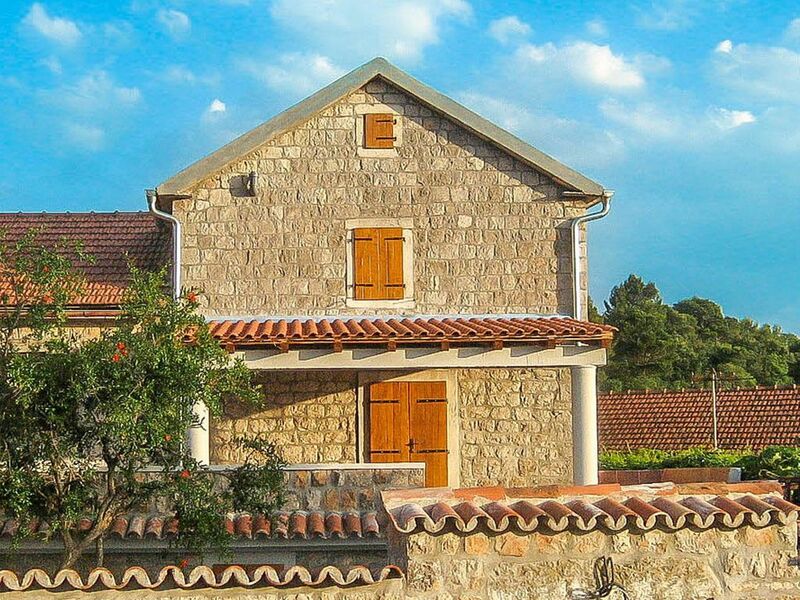 Jas Kaminski, is the proud owner of the Lustica Mill House on the Peninsula of Lustica. He acquired the house in 2005 while working in tourism in Croatia, Montenegro, and Bosnia between 2000 and 2006. For someone who was familiar with the Eastern Adriatic coast, I was pleasantly surprised to stumble on an area that had not been taken over by large scale tourism on Lustica, while, at the same time, located directly behind the airport at Tivat, and a 1h 30m drive to Dubrovnik. Two years later, the house was fully renovated with the help of Tivat based architects, Axum Architects, combining sensitive restoration with modern facilities. The house was tastefully decorated using genuine furnishings and bright materials from Nepal, in Asia, where I was living and working at the time. Peaceful, small stone village and a sense of meaningful interaction with local people. Beautiful and untouched peninsula surrounded by small beaches, with restaurants and cafes, and a series of 9 old stone villages that have a series of old stone churches The closest beaches are sheltered and located on the open sea, so the water is cleaner better Access to Herzeg Novi, 10 mins by boat from fishing village of Rose 30 mins to Kotor & inner fjord, Tivat and 45 to budva or 1h 30 mins to Lovcen and the old capital of Cetinje- so day trips are convenient Local food wine and olive oil available from locals at good prices, and supermarkets within in 10 mins, 30 mins and 35 mins of village- apart from a van that calls every morning with fruit, veg and basics. Bedroom 1 and 2 have en-suite bathroom with bath and/or shower, bidet, toilet, and wash hand basin. Bedroom 3 (good access) has large bathroom, with toilet, shower and basin directly adjacent to room. Bedroom 4 is a studio bedroom with fold out sofa bed. Tastefully decorated and furnished large living room, wooden flooring throughout and leading to second smaller living room with fold-out sofa bed for 2. Double glass doors lead through to upper furnished terrace area with canopy and plenty of seating. Fully equipped kitchen (with the solid oak wood finishes, and granite counter tops, has electric cooker, oven, microwave, dishwasher and fridge/freezer) ideally located to serve meals in either the dining or outside, under the stars, on the lower terrace. With a large twin bedroom on the ground floor, kitchen, comfortable dining area and large ground terrace area, this floor is idea for persons with restricted mobility. Notes on accommodation: This is a beautifully restored traditional mill house retaining many historic features and tastefully decorated in a unique style with comfortable and colourful Nepalese furnishings. The main facade is orientated towards the west and the overlooks the front terrace, main gate and surrounding countryside. The house is located at one side of a small county village of Marovici. There is a large private area outside the main gate to park a car, and this area is bordered by gardens and fields, as well another dwellings which shares the parking area. Outside the outer gate, the small road leads into the village, or down a lane will bring you to paths that lead through the surrounding fields to 2 well equipped beaches. The house is accessed through large exterior wooden gates and there is an intercom outside the main doors. There is ample secure children play areas inside, and outside. Outside: Two large (well-equipped) terrace areas to relax, cook (BBQ) and dine under (shaded) canopy areas on both terrace levels, or under the stars. Surrounded by traditional old stonewalls, the exterior areas have ample seating and garden lighting for evening entertainment. The lower terrace leads into the kitchen and dining rooms, bathroom and twin bedroom. The terraces are terracotta tiled throughout, have ample seating and tables to relax and enjoy the peace and tranquility of the surrounding countryside, or for eating outdoors and entertaining. There is a second (outdoor) stairway leading to the upper terrace and main house entrance with panoramic views of the countryside as well as of the small village. Utility Room: Washing machine, ironing board and iron, hoover, and cleaning equipment, electric heaters and fan if required. Cleaning / Towels / Linen / Maid service: All bedlinen and towels supplied, with the exception of beach towels. The house is cleaned and sheets/linen changed weekly. A cleaning charge on departure of 100 euros is charged, Of if staying two weeks of longer, 25E per week for cleaning/linen change. Other: A large and atmospheric dining area next to the kitchen retains original granite mill wheel feature with decorative glass top, exposed stone walls, wooden ceiling beams and polished stone floor. Glass and iron dining table and seating for 8 persons. Cycling, Walking, Sailing, Fishing, Island hopping, nearby to visits to coastal highlights of Kotor, Budva, Tivat and Dubrovnik; and Mediterranean mountain region between Lovcen and Oriel as well as historic old capital of Cetinje. Two Beaches Mirista and Janjice are 5-10 mins by car or 20 mins leisurely walk through the surrounding countryside. Both beaches have restaurants cafes and shops and as well as beach chairs, umbrellas (to hire) and a lifeguard. There are small piers from where boats regularly ply the waters the nearby centres of Herzeg Novi, Tivat, and Budva. There are several other villages and beaches on the peninsula of Lustica within a 15 minute drive, such as Oblatov, Rosa, Ponte Veslo and elsewhere. A car is essential for arrival and departure as well nearby visits to the historical towns of Budva, Tivat, and Kotor, the interesting fjord area and beyond. A car is also useful for stocking-up at the shopping centres at the nearby small or large towns of Radovici, Tivat (35 mins), Kotor (35m) and Budva (45). There are 2 new large supermarkets 25 mins away. Tivat Airport is 30 minutes by car, Dubrovnik Airport is 1h30m, and Podgorica is 2 hours away. The ferry port of bar, is 1.5 hours away. Lustica Peninsula is famous for a once thriving olive industry as well as being part of entrance to the historic Boka - Kotor fjord. While made up of rolling hills the area has churches and small villages worth a visit. Bokar-Kotor fjord is Europe's most southerly fjord and is an impressive geographic and historic area. There's many towns around the fjord including Kotor (35 min) Perast and Risan (1hour). The walled coastal town of Budva is 50 mins, island hotel of Sveti Stefan is 1 hour 10 min. Small shops and market are available on the beach (5 mins by car). While more extensive shopping available at the local supermarkets in Radovici (15 mins). Two large large supermarkets are situated on the major crossroads (25 mins) to Tivat and Kotor (35 mins) and Budva (45 mins). Fresh food and fish open air markets are situated in Tivat, Kotor and Budva. A local van calls twice a daily to deliver staples, like fresh, fruit, vegetables and dairy products. Beyond the coast and driving directly above the towns of Kotor and Budva, there are numerous mountain towns and cities worth visiting. High above Kotor and following hairpin bends, brings you to the national shrine and Njegos's Mausoleum at Lovcen. This is a very enjoyable drive with spectacular views and proximity to the mountain top is fairly straight forward with a road head close to the top. You can also take the main road from Budva to the former Royal capital Cetinje. Cetinje is pleasant drive about 2.5 hours into the mountainous interior of Montenegro. You can also use this road to get to Lovcen, Cetinje is a town of immense historical heritage, founded in the 15th century. It became the center of Montenegrin life and both a cradle of Montenegrin/Serbian culture and an Eastern Orthodox religious center. It is because of this and the heroic legend born after its eternal resistance from Ottoman intrusions, that it was nicknamed Serbian Sparta 1. It is because of its heritage as a long-term Montenegrin capital that it is today the honorary capital of Montenegro. Dubrovnik is 2 hours away and a must visit.